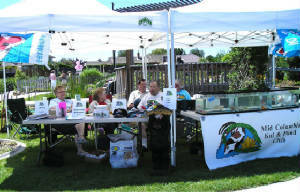 The Inland Empire Water Garden and Koi Society participated in the Inland Empire Gardeners Garden Expo in May, 2006, as the club has for the last several years. Originally we rented a 10’ X 10’ booth to hand out information about our organization. We were constantly asked if we had any plants to sell. Three years ago we started selling water garden plants and related items for their koi ponds. The response was great. We now have “customers” seeking us out every year. They come for their hyacinths, bare root lilies, iris, grasses, reeds, wind socks and whatever else they think would look good in their pond or water feature. 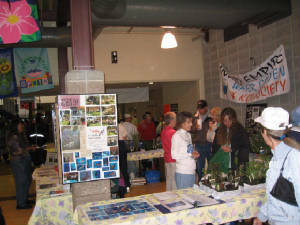 We have increased our space to a 20’ x 20’ booth crammed with plants, fertilizer and informative club members. Participation by club members has always been great. Margie Luce has been a fantastic support to the club selling the plants to us at wholesale and buying back any that do not sale. Jim Elms who celebrated his 94th birthday at our pond tour last year always comes early and leaves well after noon. He takes a chair and sits by the stock tanks holding the hyacinths and asks each patron “How many this year?” Then he bags the plants up with a smile. Kathy Rollins loves Water Hawthorne and has sold more of these plants than everyone else combined. This is the perfect event for our club to promote the hobby of koi keeping as we are exposed to 199 other vendors and 12,000 shoppers. We have gained several new members at the Garden Expo and helped many others alleviate problems with their ponds through simple time tested remedies. 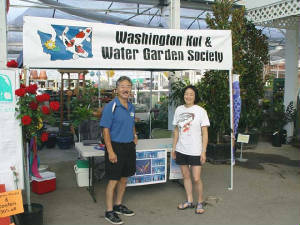 On June 17, 2006 the Mid-Columbia Koi & Pond Club participated in the 5th Annual Garden Faire sponsored by the Tri City Master Gardeners Association in Kennewick, WA. I believe the club has participated in all five of these events and we will have a booth with club info this year as well. This year’s Garden Faire will be on June 2 in the park behind the Kennewick branch of the Mid Columbia Library on South Union St. 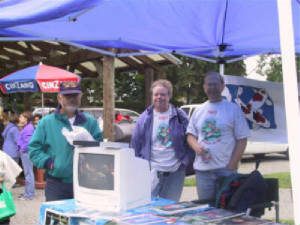 Despite the fact that last year’s event was held exactly 7 days after the PNKCA Convention, which we sponsored, a dozen or more dedicated club members made their way out to the event early and set up shop. We were pretty tired still from the convention, but spirits were high. We had hats, t-shirts, water plants, plus some goldfish & koi on display. The club managed to attract at least three new members and some current members took advantage of the central location to renew their memberships as well. While it’s only held one day, we like participating in Kennewick’s Garden Faire because it attracts hundreds of people—many of whom may not heard of us. All day long we had folks stop and ask different members questions about ponds. Some already had one, others were thinking about installing one. Brochures were offered that gave information about the club. Also this event gave us a great way to let the public know about our annual September pond tour. 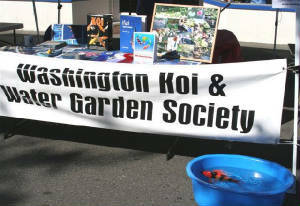 The Washington Koi & Water Garden Society participated in two outreach events in 2006. First, the August 27th Bothell River Fest, held in downtown Bothell featured "Electra," the amazing koi, and her handlers, Nancy Moore, Lucy Macneil, and Joyce Tsuji. The club's booth was in the hobby section of the Fest and drew lots of interest. The second event, promoting the benefits of club membership, occurred at Furney's Nursery on Labor Day weekend; club members Don Shimono, Ted Griffin, Joyce Tsuji and Tom Ohtani set up our booth and handed out club brochures and talked with shoppers about koi and ponds. The OK&WS became involved with a project at the Wildlife Safari when a long time member of our club, JX Wilson, passed away in June of 2005. His widow, Pat, ask that donations be made to the Wildlife Safari where JX had volunteered for many years. 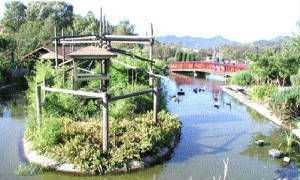 It had been JX’s dream to see a Koi pond built at the Safari for the many visitors to enjoy. The Club decided that we would not only donate funds for this project but also do manual labor in order to make the funds go farther, and to also give a lot of technical advice on what was required to keep a healthy pond for the Koi. We met with John Dees who was the Safari’s representative in charge of the building of the water features at the Safari, to discuss where the pond would go and the necessary filtration required to maintain a healthy pond. Several members showed up to clean bogs, drains, briar bushes and anything else necessary to make ready for the pond to began. That fall the first Koi was put in the pond and this has been an on going participation by the club. The pond is evolving into not only a Koi pond but as a teaching tool at the Safari for other conservation elements for our natural habitat. A lot of field trips from the schools in the area come and have science classes and this is a great teaching example. Pat Wilson has been presented a Bronze plaque to be mounted at the pond in memory of JX Wilson and as soon as the weather permits it will be installed at the pond. The club members will still serve as an advisory source and help with any work that is required to help maintain this pond. 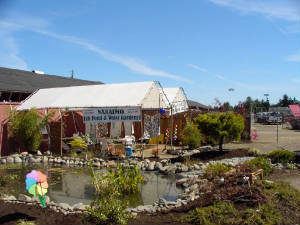 The Nanaimo Fish Pond And Watergarden Association had their annual back yard water garden display at the Vancouver Island Exhibition on the 18, 19 and 20th of August 2006. The club has been doing this project yearly since 1999. This year’s display consisted of two ponds joined by a 20' long stream with a bridge over it. The upper pond containing the koi had a waterfall as a water source and was approximately 14' long, 14' wide, 2' deep and held 2940 gallons. The lower pond devoted to plants alone was about 24' long 16' wide 18" deep and contained 4320 gallons. Under the tents we had club members on hand at all times to answer questions from the public as well as a display of laminated posters containing all sorts of information on ponds koi and water gardens. The display used 80 yards of earth and 8 tons of boulders to construct. After the water features were completed we then brought in about $6,000.00 worth of plants and 8 yards of top soil. The whole display takes 4 days to build and comes down in about 4 hours when the exhibition is over. The exhibition itself draws about 20,000 people for the weekend and our display is viewed by about 1500-2000 over the 3 days. Many people come back every year just to see our display. One of the highlights is always the koi of course. Being blessed with a pond and the joy of having those lovely, finny friends, Koi; it soon becomes apparent that you are on a lifetime journey with a hobby that becomes more and more addictive, a far cry from those other depressive addictions. The beauty and joy of water gardening and Koi keeping truly enlightens and enriches one’s soul. Hoping to further enhance the beauty of water gardening and meet its objectives and purpose of educating its members and the general public, the Idaho Water Garden and Koi Society invited Richard Koogle, operation manager of Lilypons, to speak in Boise, Idaho on February 18, 2006. Richard is a true connoisseur of water gardening. Involved in water gardening for over twenty-four years he is recognized by the industry as an authority and has lectured throughout the United States at universities and colleges, regional and national professional nurserymen associations and local garden clubs. He has also lectured at the National Arboretum and teaches Master Gardener courses. This very accomplished speaker has made numerous appearances on shows such as Good Morning America, From a Country Garden, and Backyard America. He has also appeared on regional and local television stations and various radio programs. National circulated magazines Martha Stewart Living and This Old House have tapped Richard’s water gardening prowess. He has also written articles for various newspapers. His contribution to print has also produced the best-selling Ortho’s All About Building Waterfalls, Pools and Streams (2002), co-authored with Charles B. Thomas. We were very fortunate to have Richard speak to us at a free public lecture held at Boise State University Department of Biology and Horticulture. 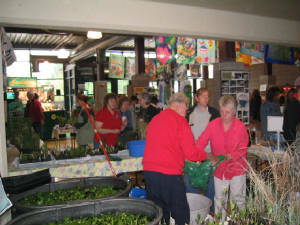 This scheduled hour became a lively three hour discussion as Richard’s enthusiasm for water gardening inspired his audience into a question and answer period about his slides, which featured many of the best additions of pond plants available in recent years, as well as his vast knowledge of ponds and their care. A most gracious person, Richard Koogle had consented to speak at the annual spring banquet of the Idaho Water Garden and Koi Society that same night. A much shorter, though equally inspiring presentation of the latest and best pond plants for 2006 was well received by the audience of long time Koi hobbyists and brand new entrants to this fascinating and soul enriching past time. Richard returned to Baltimore, Maryland on Sunday morning. He truly is a lover of this wonderful art of water gardening and to have him here in Boise, Idaho was an interesting and educational experience. Click here to the Yakima Club 2004 Grant article. Click here to read Dai-Ichi's 2004 Grant article.